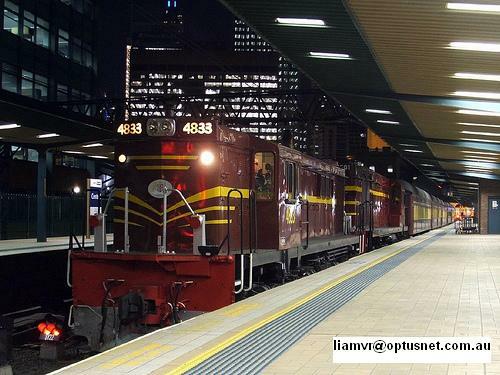 Goodwin Alco owns and manages a fleet of heritage diesel locomotives which were constructed by builder AE Goodwin Pty Ltd.
Goodwin Alco owns former NSWGR locomotives 4501 & 4833 and is also a shareholder of the Lachlan Alco Locomotive Group which owns former NSWGR locomotives 4464, 4473 & 4486. Goodwin Alco was recently awarded 1 item of NSW freight rollingstock from the RailCorp Non core heritage rollingstock disposal process. L813 (the last S truck in Dubbo yard) has joined the Goodwin Alco fleet and provides another opportunity to continue its heritage preservation activities. Goodwin Alco wishes to thank RailCorp for having the confidence in us to provide future care for this valuable heritage item. Goodwin Alco has now purchased ex NSWGR 2 car diesel train 629/729 from Railcorp. These vehicles will be restored for future heritage passenger operations in the near future. For more information regarding our locomotives look at our locomotive blog site and news page.